Two days before Apple’s next media event, where long-overdue new laptops presumably arrive, the Cupertino, Calif.-based tech giant released fiscal fourth quarter and closed full-year 2016. You could feel the anticipation after the Bell closed on Wall Street today—and, honestly, it had been palpable for weeks. Shares closed $118.25, up .51 percent. As I post, they’re down about 3 percent, after hours. The drama is a TV thriller: Release of iPhone 7 and 7 Plus set against a backdrop of saturated global smartphone sales; launch of Apple Watch Series 2 into an already declining market for smart timepieces; analyst data showing calendar third quarter to again be bad for PC shipments—with even Macs losing momentum. So everyone wants to know: What was the quarter’s financial crop? “Our results were very strong”, Apple CEO Tim Cook boasts, speaking during today’s analyst conference call. He repeatedly emphasizes the importance apps, music, and other services, which revenue bloomed 24 percent annualized. For the fiscal quarter: $46.9 billion in sales, $9 billion net income, and $1.67 earnings per share. Wall Street consensus was $46.89 billion revenue and $1.65 EPS. Year over year, revenue fell from $51.5 billion and net sales from $11.1 billion. For the fiscal year: $215.64 billion in sales; $45.69 billion net income, and $8.31 EPS. Wall Street consensus was $215.68 billion revenue and $8.27 EPS. Year earlier actual: $233.72 billion and $9.28 EPS. For fiscal Q4, gross margin was 38 percent compared to 39.9 percent annually and 38 percent percent sequentially. Once again, international sales accounted for most of the period’s sales: 62 percent, same as the previous year but 63 percent three months earlier. Apple closed the quarter and year on Sept. 24, 2016. 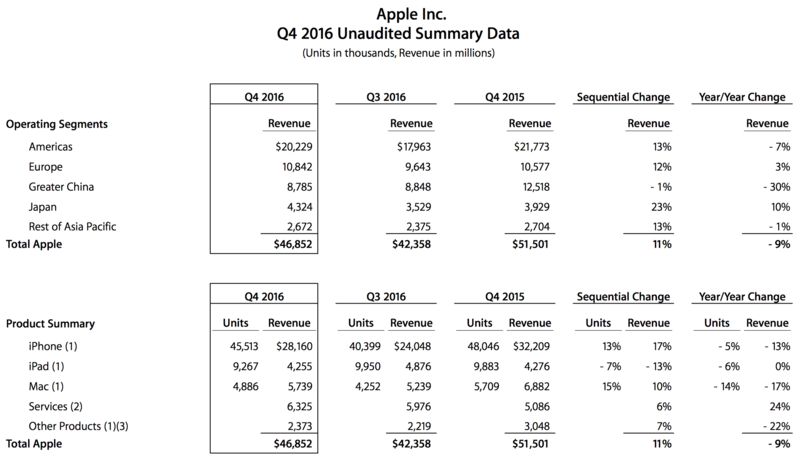 Looking ahead, Apple expects fiscal first quarter 2017 revenue to be between $76 billion and $78 billion, and gross margin ranging 38 percent to 38.5 percent. Guidance is higher than Wall Street consensus: $74.98 billion. New versions of iOS, macOS, and WatchOS open the way for more so-called “halo” sales across product lines—particularly with features and extended cloud services that better cross-integrate capabilities among Apple devices. Earlier this month, Samsung permanently withdrew flagship Galaxy Note 7, due to a fatal flaw causing some batteries to overheat, catch fire, or even explode; the phablet had been in market for less than two months. The vacuum is one iPhone 7 or 7 Plus could fill. Then there is the China storm: The world’s most populace country now generates the most revenue for iOS apps, signaling potentially greater opportunities for Apple extended cloud services and for products from the company’s development partners. But there also is the China Syndrome: The country was Apple’s second-most valuable region during fiscal fourth quarter 2015. A year later, No. 3, as revenue plummeted 30 percent to $8.785 billion—essentially flat quarter on quarter, suggesting ongoing trend. But these narratives are a story told in part during the next quarter’s earnings results. That said, promising uncertainty will be seen by some customers, investors, and partners as opportunity. Before presenting quarterly results by category, let’s look at some recent analyst data. iPhone. Even with iPhone 7 and 7 Plus release, eMarketer predicts that full-year 2016 U.S. smartphone share will be flat at 43.5 percent share. By comparison, Android: 52 percent, also will be static. The latest data from Kantar WorldPanel tells a different story, Based on smartphone OS, Android holds commanding 65.2 percent share to iOS’s 30.9 percent in the United States. Elsewhere: Australia, Android (62.5 percent), iOS (32.6 percent); France, Android (75.7 percent), iOS (18.1 percent); Great Britain, Android (58.9 percent), iOS (35.9 percent); China, Android (85.9 percent), iOS (13.5 percent). Caveat: The data precedes Samsung’s Galaxy Note 7 fiasco, which could yet benefit iPhone among a choice buying segment of trendier and wealthier buyers. Broadly, the global smartphone market is slowing across major geographies. CSS Insight forecasts 4.1 percent year-over-year growth in 2016. However, the devices will continue to gain share of the overall mobile phone market. iPad. In the United States, Apple will continue to lose momentum, eMarketer forecasts: 44.7 percent market share. More than half of Americans use some kind of tablet at least once a month. Broadly, the global tablet market declined 12.3 percent during calendar second quarter, according to IDC. Apple leads the market with 25.8 percent share, but shipments fell by 9.2 percent. Calendar Q3 data is not yet available. Apple Watch. During third calendar quarter, which is largely congruous with Apple’s fiscal fourth, smartwatch shipments plummeted 51.6 percent to 2.7 million from 5.6 million a year earlier, according IDC. Google’s delayed release of Android 2.0 contributed to the declines; Apple Watch sales chilled in anticipation of the newer model. The fruit-logo company remains category shipment leader, with 41.3 percent share, which fell by stunning 71.6 percent year over year. The numbers aren’t necessarily bad for the smartwatch, with Apple clearing out old inventory and Android manufacturers stiffed by the new operating system’s delay. Mac. Global PC shipments fell by 5.7 percent year over year during calendar third quarter— eighth consecutive decline in a row, marking the longest period ever recorded, according to Gartner. Globally, Apple fell from fourth to fifth place, with 7.2 percent share and shipments slumping by 13.4 percent. In the United States, Macs dropped 10.7 percent, ranking fourth with 12.9 percent share. For most quarters since the 2008 economic collapse, Apple bucked market trends by growing sales and shipments even as rivals’ persistently stumbled. But with the last update to the MacBook Pro line arriving in March 2015, Apple laptops are overripe on the vine. The question: Will the expected new models debuting on October 27th reinvigorate demand? iOS. According to App Annie, iOS revenue in China topped the United States during calendar third quarter: $1.7 billion, or by 15 percent. Journalist Philip Elmer-DeWitt tabulates one of the most accurate assessments of analysis consensus of Apple product expectations. Consensus data is his, for professional analysts only. iPhone. During fiscal fourth quarter Apple shipped 45.5 million iPhones, down 5 percent year over year. Analyst consensus: 44.93 million. Revenue fell 13 percent to $28.16 billion. The smartphone accounted for 60 percent of revenues, down from 62.5 percent a year earlier but up from 57 percent the previous quarter. “iPhone sales were up year over year in 33 of our top 40 markets”, Cook says. He claims the company had the highest number of Android switchers “than ever before”. iPad. During fiscal Q4, iPad shipments reached 9.27 million, down 6 percent. Analyst consensus 9.16 million. Sales reached $4.25 billion—flat year over year. Mac. Computer shipments fell 14 percent to 4.89 million. Analyst consensus: 5.15 million. Revenue fell 17 percent to $5.74 billion. Apple Watch. The company did not reveal hard numbers. Analyst consensus was 2.61 million sold. Cook did tell analysts today that demand exceeds supply. Services. The category’s revenue surged 24 percent year over year to $6.325 billion, propelling Services to second sales earner—behind iPhone. 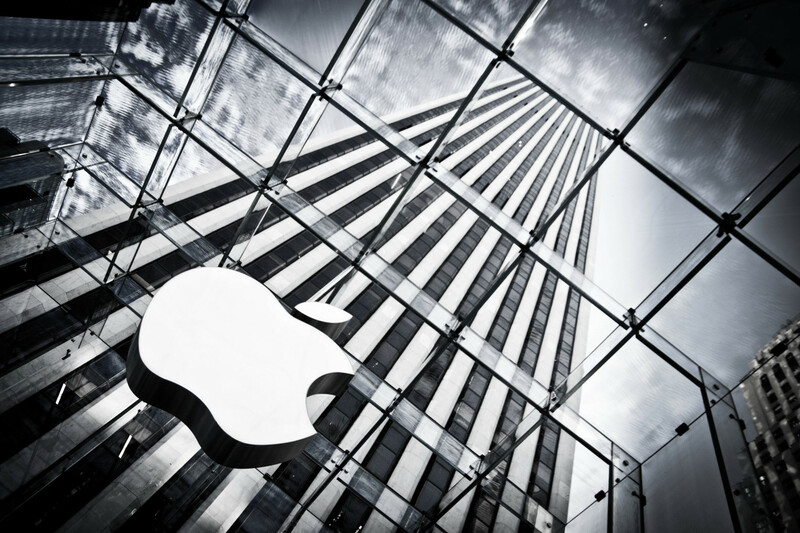 App store revenue “skyrocketed”, Cook says, “while music revenue grew by 24 percent”.